What is cuter than a kitten? Two kittens of course! These two are brother and sister. The small grey one is a tabby named Macbeth and the calico is a little girl who has yet to find her name. So, where does the rant come in? I did not need any more cats. Although I was recently informed that you needed 11 to officially be a "crazy cat lady", I do feel that these two upping my count to seven brings me dangerously close. They are part of a litter born in my woodpile. The mother is a beautiful cat who was adopted by one of my neighbours. She took the cat because it was a well bred, valuable cat and then she left it outside, fed it only occasionally and let her become feral. Of course, shots and neutering were out of the question. The father is a tomcat who belongs to another neighbour, a much nicer person but still rather callous when it comes to animals. Between my husband, my daughter and myself we managed to capture three of the five kittens in the litter before the mother moved them to another location. The third kitten, a little black and white female, has since been adopted by my son. The other two are now part of my family, having suffered through a couple weeks in quarantine in the spare room until they had their shots. As my daughter asks, why don't people listen to Bob Barker and spay or neuter their pets? What do they think happens to them? They become diseased or they are caught by coyotes or other animals and in either case they die a horrible death. Or, if they make it to winter, maybe they get to freeze to death instead. I firmly believe you should not have a pet unless you are willing to take care of them. Pets are not possessions and they are not disposable. Smarten up people! I have been trying to think up a clever acronym for the way my stitching life is this week, stuck in the mud. I am feeling so uninspired that I can't even do that though. Hopefully this weekend, while I have the house to myself as a sports widow (the rest of the family will be out at the CFL Grey Cup festivities and game), I will put a threaded needle to fabric and get over my funk, but in the meantime I'll just post about other stuff so you know I'm still around. If you can think of a clever acronym, let me know! The photo, by the way, is a beautiful sunrise from the other morning. One good thing you can say about winter - you don't have to be an early riser or a night owl to see either the sunrise or the sunset. I'm in a Secret Sister Exchange on one of the online quilting groups and just received another package from my Secret Sis. I am beginning to think she knows me too well! She sent me a lovely fat quarter with butterflies, seed packages and flowers that immediately made me think of appliquing some of these items as motifs. Now, when I decide to do this I can never find the teflon ironing sheet I have around and my SS must know that cause she sent me one! What is really scary though is she sent me cleaner for my iron so she must know what a mess I make when I start to "play"! roflol Thanks, Secret Sis, - I'll have fun with this! Last week I spent a great day with my friend, Eileen, at the International Market at Spruce Meadows in Calgary. This is Eileen standing by some wooden stars we thought were pretty cool. Nothing to them but, with the lights and all, a great country-style decoration! I was very taken by these. Although at first glance they look like ribbon roses, if you look closely you can see they are actually small purses. The entire front of each purse is a huge overblown fabric rose - gorgeous! I have seen Christmas decorations made by glass blocks before but this was the first time I had seen it with the use of lights. I thought it really added another dimension to these festive bits of fun. We found this incredible goldwork dragon at a booth dedicated to the silk embroidery of three Chinese artists. I wish I had taken more photos or, better yet, bought more! This silk embroidery of carp feeding was my other favourite from this booth - it was so beautiful! Occasionally I find silk embroidery pieces like these at the thrift stores and I snap them up and incorporate pieces of them into my pieced crazy quilt blocks. We saw so many wonderful ideas! I joked with Eileen that I was shopping for ideas - not gifts! Look at these gloves though so see what a bit of embellishment can add to an ordinary item. Just a bit of velvet made these simple gloves sophisticated and elegant. It was a great market and I think I will have to make it an annual event. Thanks to Eileen for inviting me along! This is my seam treatment I did with the cretan stitch variation from week 40 of the BAS (Build a Seam) challenge. I hope everyone else had as much fun with this one as I did! I had completely forgotten entering a little contest and winning when the prize arrived in the mail from Lyn. What a great surprise! It is a great book, suitable as a journal, the cover of which has been altered, embellished and adorned. There are silkie like images on both the front and the back, buttons in the corners, ribbon around the edges with this great fluffy yarn attached all the way around. Sparkly butterflies are flitting around the lace and sparkles. Isn't it just so "girlie"!? Thank you Lyn - I love it! I could not resist this little cardboard box when I saw it at the thrift store - not with all the little temari balls on it! Great little box to keep something in, right? Here the puzzle begins... When I opened the box it is full of these little items. Are they candy? Too prettily carved to be candy perhaps. Little guest soaps? Sort of small even for guest soaps. So, can anyone help me with this mystery? I am curious as to what these are in this box! Soon after returning home from the CQI retreat this year, Debbie in Maine's family suffered a tragedy when the home of her son, Todd, and daughter-in-law, Melissa, was struck down by fire. They lost everything in the fire, including the lives of their two beloved dogs. The ladies at CQI are making Christmas ornaments and sending them to Todd & Melissa to cheer up their Christmas and let them know we are thinking of them in these difficult times. This is the little ornament which I have just finished for them. I really enjoyed making this little stocking and played around with new seam treatments. I hope they enjoy it! I'm trying to justify a post about my pantry - I think I can since stitchers have a strong attraction to stories about UFOs getting finished, or at least this stitcher does! lol The pantry was a big messy UFO for at least a month. I completely redid it which involved unloading all the stuff from there into the kitchen and dining room and dragging out all the shelving units. They went out to dh's workshop which he has recently enlarged and the new shelving units took up temporary residence in the living room. Then I scrubbed the whole thing from ceiling to floor, masked and painted it all including the french door. Advice for the day - don't paint french doors unless you have to because it's a pain. On the other hand, it turned out so pretty and now it matches my kitchen cupboards which are also white. One of the new units I put in there is a closed cupboard for food items - holds lots and the doors offer extra protection in case a mouse finds his way in there somehow. This is the view when you open the french door now. Am I organized or what?! If only my stitching room was this organized. Well, it will be someday soon! The monthly challenge at CQI this month is all to do with organization of stitching supplies so I'm taking lots of notes and am almost ready to take that big job on. This week's BAS (Build a Seam) Challenge is the Braid Stitch. A tutorial for the stitch appears in the next post. It is not a difficult stitch to do and it is more visually interesting than just a plain chain stitch would be. I hope you have fun with this one! For anyone not familiar with the BAS Challenge, you can read about it in a previous post here. So, if you are unpacking things and leave a pile of empty cardboard boxes, what is the first thing that happens? A cat finds them of course! What surprised me is that the cat in the box is seventeen years old, completely blind and suffering from dementia. I have been thinking lately about his quality of life and whether it is getting to be `time`. But then I get a glimpse of the kitten he was when he does something playful like this! I just finished working on Kathi's block from a round robin at CQI. It was a great block to work on - wonderful fun colours so I went with the bright colours and had a blast. I was first to work on it and Kathi's instructions were just to have fun so that's what I did. I went with sort of a garden theme. The first thing I did was a butterfly with Janet's technique. I have a couple more pieces of butterfly fabric now so am able to play with this some more. It is done by cutting out two identical butterflies from fabric. Cut down the center at the body and put the right sides together and sew around each wing, except for where you cut it. Turn them inside out, press and voila! You sew them onto the block at the centre and after you add a replacement body - this one is beads - and some antenna, you have a wonderful three dimensional butterfly with wings that stand up from the block. I also did the two seams in this picture. The vertical one is a simple herringbone stitch laced with a nice sage green velour thread. Then I added trios of detached chain stitch. The second seam is a simple cretan stitch. 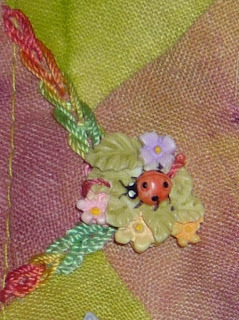 At the top and bottom of each stitch I added two detached chain stitch leaves and then a silk ribbon french knot. My second motif was this cluster of fantasy flowers made with raised spider webs. This was my sample for last week's BAS (Build a Seam Challenge). The stems are stem stitch and the leaves are feather stitch. The little butterfly beads I scattered around are plastic but I couldn't resist the colours. Just above there is a small seam done in braid stitch with varigated silk perle thread. Where the two lines of braid stitch met I added a resin bead I think I acquired by cannibalizing some thrift store jewelry. It seems to fit the colours and feel of the block. Here is Kathi's block as it looked when I was done stitching. It is headed off now to Alice who gets to go next. I hope she has as much fun with this block as I did! This is my daughter's bloodhound, Duke, patiently keeping watch for her to come home from work. Both Duke and my daughter recently moved back home (thanks to an unscrupulous landlord who rented a condo to her when he was just weeks from a foreclosure judgement). I missed my daughter very much while she was on her own so I'm happy to have her back at least for awhile. Surprising enough, I am very happy to have Duke back too! There are cat people and dog people and I have to admit I had always considered myself a cat person. This is the dog that changed all that! Isn't he gorgeous?! I got a wonderful email today from Leslie with this picture of the wedge she embellished for my tree skirt in the Christmas round robin we are in. It is soooooo gorgeous! I couldn't be happier. I might not have this project ready for this year - to be honest I know I won't have it ready - but next year it will be around my table top tree. I hope this picture will enlarge when you click on it so you can see all the beautiful details. For this week's BAS, I have chosen the Raised Spider Web. I am in the mood for flowers - maybe because winter is fast approaching and spring blossoms are a long way away so if I want to enjoy any flowers I'll have to make my own! This is a fun stitch, easy and effective, and lends itself to various motif applications. I have made a small tutorial (see the previous post) which I hope explains well enough how to do this one. Have fun! I have wanted to do some of these Raised Spider Web stitches lately and finally found a spot to put them so I thought I would take some pictures as I go along and do up a little tutorial. Begin by drawing a circle on your fabric as a guide. Next you use straight stitches to create the spokes. If you imagine the face of a clock you would bring your thread up at the 3 and down at the 9, then up at the 6 and down at the 12. Carry on in this manner to create two more spokes evenly spaced between the first ones. This will give you four although you can do more if you prefer. Bring your needle up as close to the center as possible and make a tiny straight stitch, catching all the spokes and securing their position. Bring your thread up very close to the center again and slide the needle under one spoke. Take your needle and thread back over that spoke again and then go forward under two spokes. Carry on going back over one spoke and forward under two, working your way around the circle until the spokes are covered and the circle is full. In this picture you can see the finished Raised Spider Web as well. I think this is a fun stitch with lots of applications. I can see them as flowers or as starfish in an under the sea theme. Finally, I have finished my work on Jo's block for a Christmas round robin we are in together and will be mailing it off to Japan in the morning. Jo's block looks like a Christmas tree and Leslie had stitched a Teddy Bear under the tree so I wanted to add another toy. This is the polar bear pull toy I stitched to keep the teddy company. The wreath around his neck is done in french knots with Gloriana Petite Princess perle silk thread. The harness and lead is done in some Kreinik braid and the body of the bear is good old DMC. The bear was worked in white embroidery floss and was cross stitched and then over that I did encroaching gobelin stitch. I worked the whole thing with waste canvas from a pattern in this year's Cross stitch Christmas ornament magazine. I wanted to add candy looking buttons for the wheels and turned the house upside down for them until I remembered I had put them on another block. So, I ended up settling for these vintage plastic buttons - I thought they looked like wheels. For this seam I started with a series of Christmas trees worked in fly stitch. Then I added the gold lace trim and a painted mother of pearl button I did at this year's retreat. I was amazed that Gerry was able to teach me this technique and that I was actually able to learn it. I ended up making two buttons with cardinals painted on them and this is one. I was so fortunate too that Gerry gifted me with another button that she used as a sample in her teaching! Thanks Gerry! This was a very simple seam of double laced back stitch. The gold back stitch is done in a mystery thread cannibalized from a kit I picked up at the thrift store awhile back. The red and green threads laced through the back stitch are silk. The glass snowmen beads were another thrift store find. I came across a set of Christmas themed wine glass charms and knew that I had to get them and take the snowmen off for this block. I'm not sure if Jo will think they are too big and clunky but is she does I am sure she will find somewhere else to use them where they will be just perfect. This was actually the first patch I did on Jo's block - just a scattering of snowflakes. Some are cut from a trim I got in a Christmas baggie swap at CQI, one is a sequin, one is cross stitch using waste canvas and the large one I found at my favourite funky fabric store. It was just too gorgeous to leave there - had to have it! lol This must be the magpie in me coming out again. The little bullion stitch robin is done in DMC again. I wasn't perfectly happy with how he turned out but this was my attempt at it and eventually you are faced with either going with an attempt and being happy with it or chewing up the fabric underneath so badly you have no choice but to cover it. The snow under him is some thread called Ersatz - another "hairy" thread, this time the wisps being very glittery. So, without further ado, here is the whole Christmas tree block to date! There are so many lovely things already on it - Debbie's snowman face peeking around the corner, Leslie's gorgeous beaded cardinals and her fuzzy little teddy bear, etc. I am almost sad to send it away! I have one more block to work on in this round robin - a stocking for Hideko. I can't wait to start!